This entry was posted on May 15, 2011 at 6:41 am and is filed under Garden Blogger's Bloom Day, Gardening Gone Wild Photo Contest, landscape design, native plants, Shade Shrubs with tags Garden Blogger's Bloom Day, Gardening Gone Wild Picture This Photo Contest, GBBD, GGW, GGW Photo Contest, magnolia, Magnolia sieboldii. You can follow any responses to this entry through the RSS 2.0 feed. You can leave a response, or trackback from your own site. Why do you grow the wisteria with honeysuckle? Lovely look around your garden this May. You do have an incredible selection this month. So, so pretty. Happy GBBD, Carolyn. And great photo for the GGW contest. Everything in the garden is rosy, Carolyn. 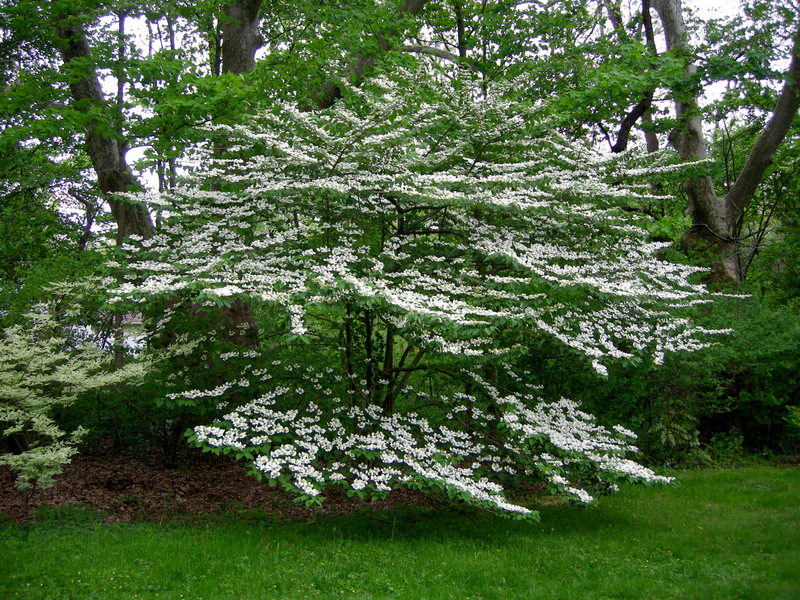 Cornus are top of my wishlist for the garden I only have in dreams. And wow the wedding cake tree is an eye-ful – most appropriate that you’ve dedicated this post to hardworking hubby. No flowers of course for me (apart from a very light smattering of violet on some lemon thyme in a window box). Do you grow smilacina? Our gardener has just sent us a photo of a clump of them in full flower at the moment in our little English garden, sadly rented out and enjoyed by someone else. Smilacina is such a beautiful thing, and I am imagining you must like it too. Carolyn, the white flowers are a ‘weed’ on the farm. The fields are full of them and I have no clue what they are. I will send my photo to our extension officer. He is a horticulturalist and will definitely be able to ID it. 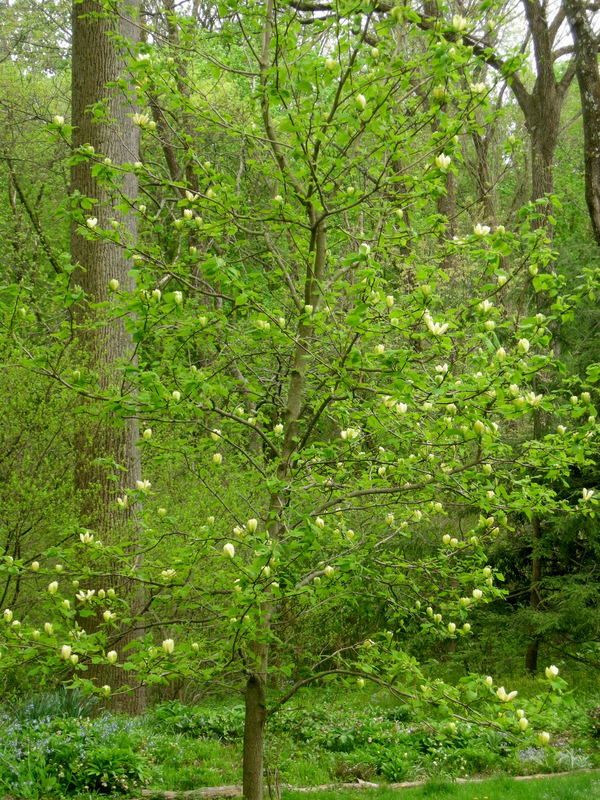 I so miss the dogwoods in PA. We have them here, but they are rarely are beautiful. You garden is so pretty at this time of year. I am so sorry to have missed it. Carolyn, once your gardening season gets going it doesn’t half take off. Progress of growth is much slower here but still looking good. You have so many wonderful plants and pictures of them. My monitor has developed grey horizontal lines which were spoiling it a little, but it has just clicked back in to perfect mode again. 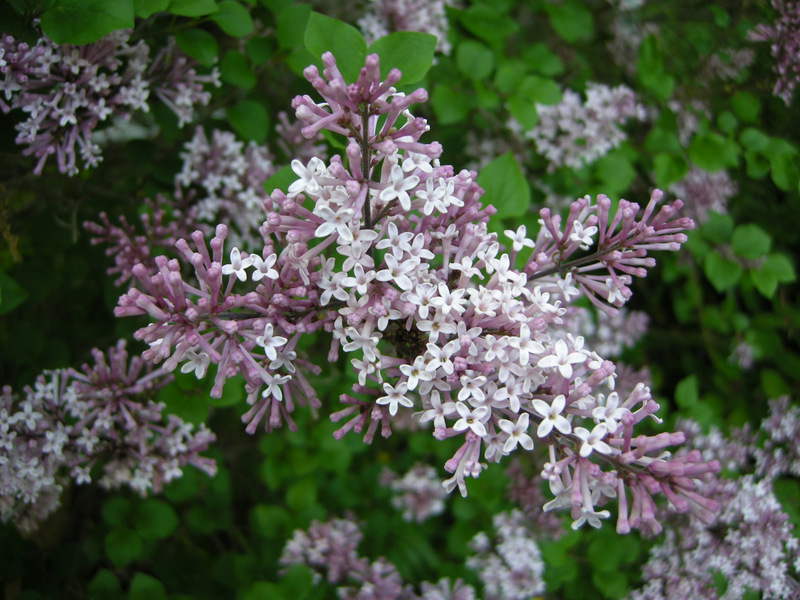 We have just ordered the Palibin’ dwarf Korean lilac, it is said to do well in containers. Wow! Where to start? Well, first of all thank you for that lovely picture of the honeysuckle and wisteria. It’s a beauty. And kudos to your husband for doing such a good job of training that wisteria. I know it is not easy at all. And a hello to Michael too. It’s so nice he works in the garden with you. You have so many woodies (my favorites) that it is like wow. They are all stunning and planted to perfection. Especially that doublefile! 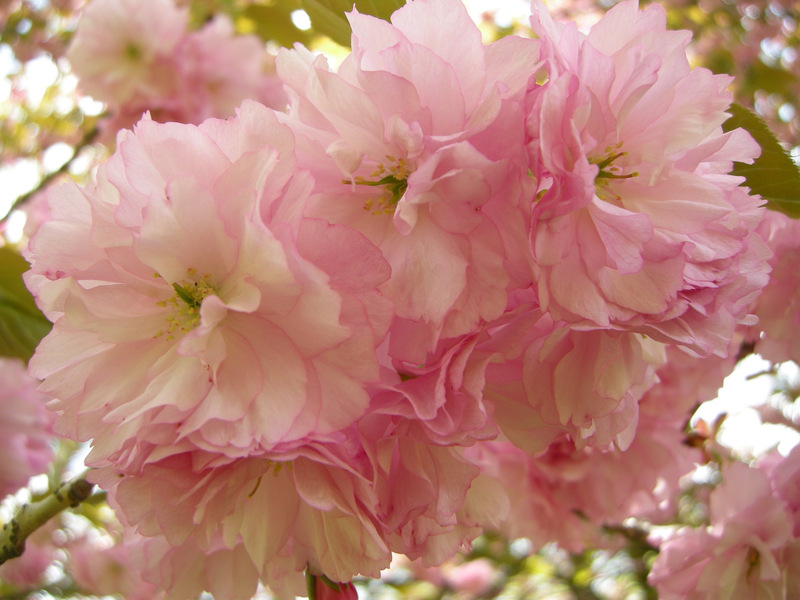 Your garden must be such a beautiful place to visit Carolyn and kuddos to your hubby for all his hard work as he must be delighted at this time of the year when you are rewarded with such exquisite blooms especially from those magnolias, wisteria and malus and cherry blossom. Have you any tips of getting epimediums to flower – I have a beautiful clump of heart shaped leaves for years but only once in 7 years have I seen yellow flowers………. I think they were yellow! Oh, my, what a beautiful garden you have! An embarrassment of riches, indeed. But I’ll bet you are not one bit embarrassed! What wonderful ideas here! Love the wisteria with the honeysuckle. I’ve never heard of doing that, but that would be such a great combination. You must have taken a lot of time to train it like that – it looks gorgeous. 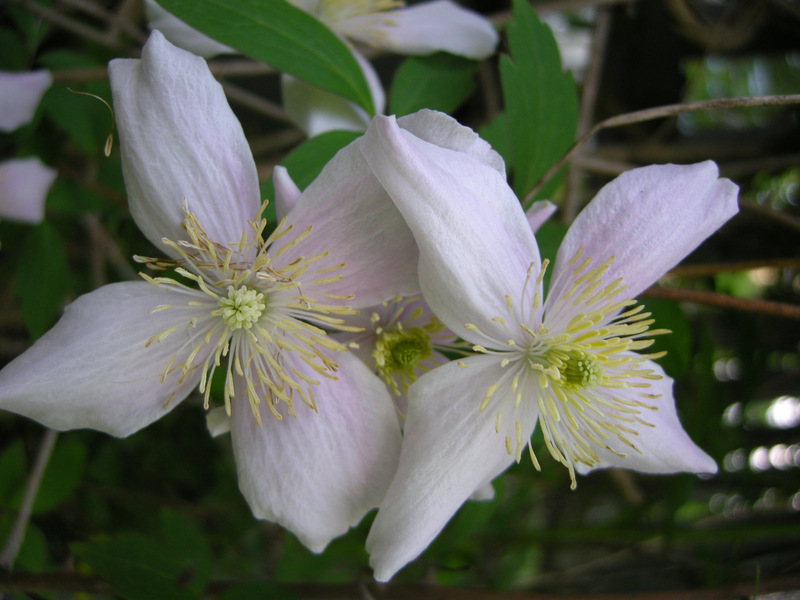 And I love the clematis on your railing! Heavenly! After that showing I’m quite embarassed about my few little blooms. Your gardens are simply Magnificent!! How I wished you lived nearby so I could pop in to get advice from you. All I can say is WOW, WOW, WOW!!! There is nothing I don’t love in the post above. Micheal you truly are “the Man”. I was going to ask how many gardeners you employ to maintain the “botanical gardens”. Your selection of blooms is wonderful and I always enjoy visiting to see what you have. 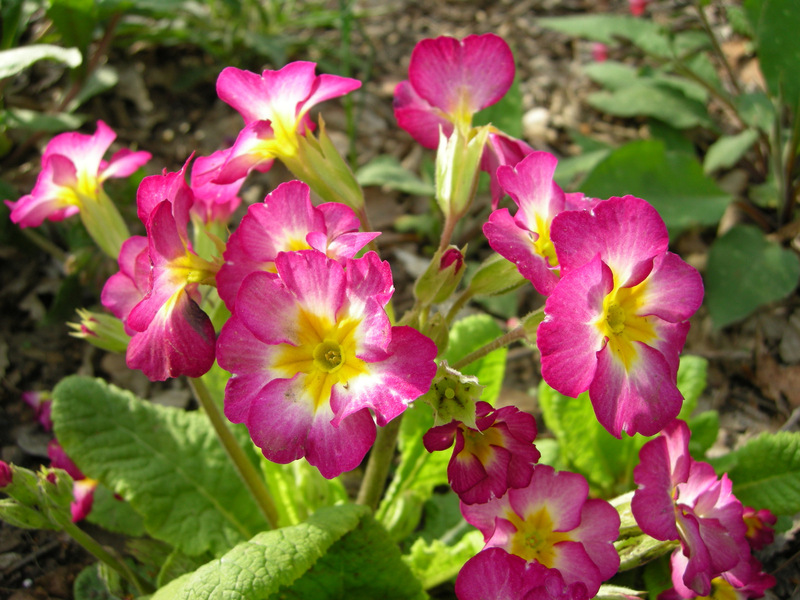 The primrose, magnolia and kwanzan are magnificent this year and everything is looking amazing! Happy GBBD! 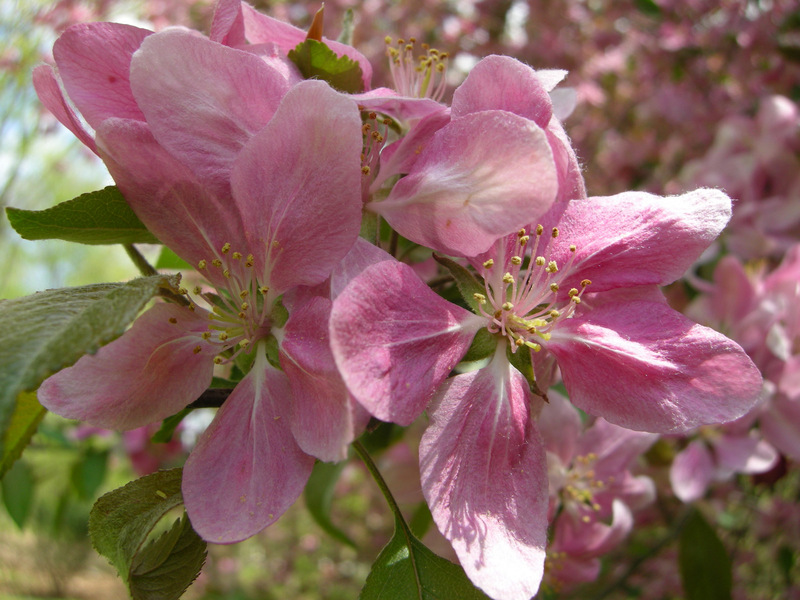 You have so many beautiful blooms today, but I especially liked all the trees and shrubs. 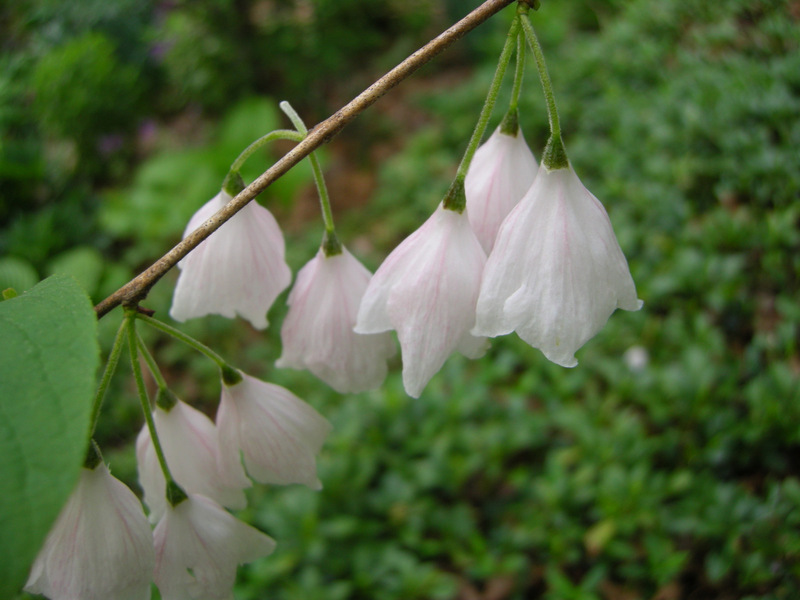 I wish you had shown the form of the native silverbell. Those are fascinating flowers on it. I also really liked the Clematis on the railing. You picked an excellent picture for the contest, the lighting really brings out the velvety texture of the bud. Good Luck on the contest! Happy May GBBD, Carolyn! Kudos to both you and Michael. Stunning photos, as always. 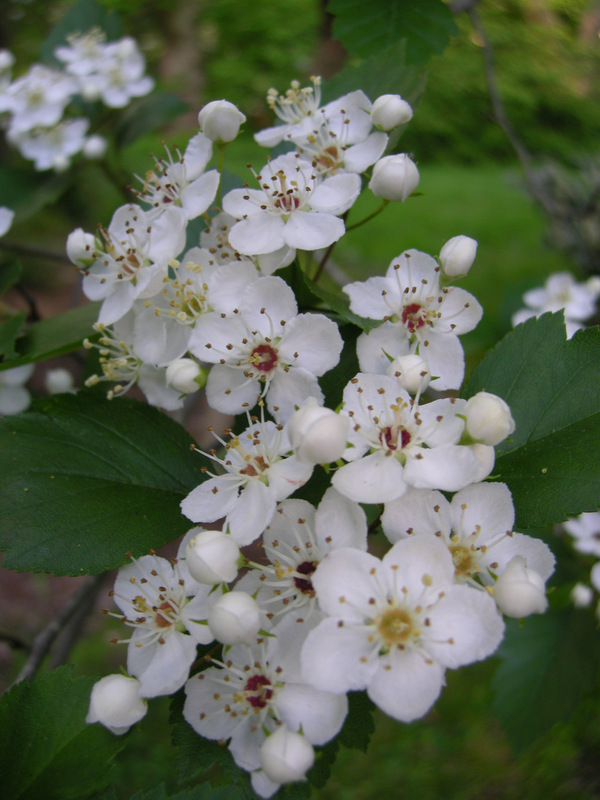 I love the photo of that gorgeous ‘Winter King’ hawthorn flower. Good luck with your contest entry — the paperbush buds photo is a prizewinner in my book! 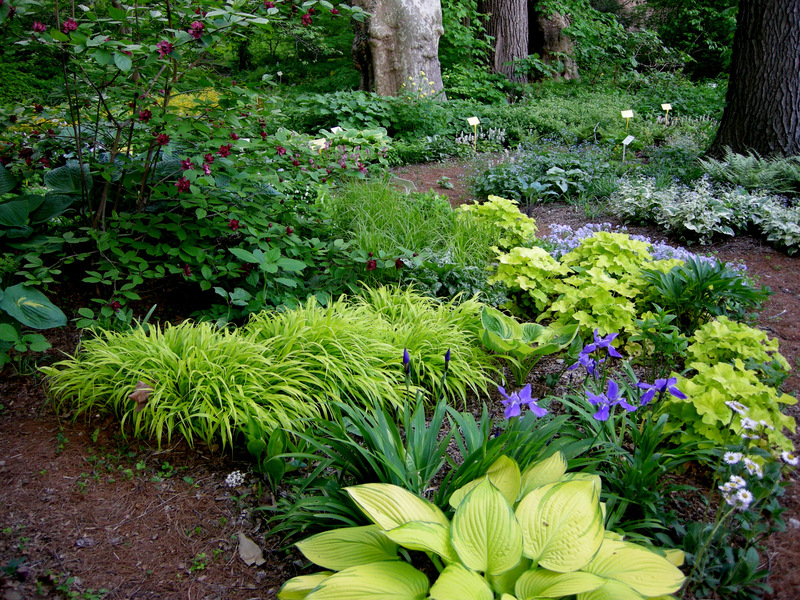 May I ask the name of the beautiful yellow hosta in the foreground in your woodland garden photo? so many nice flowers! I prefare your Magnolias and Clematis! for google translator which you can put in every kind of homepage, maybe it works! Thanky a lot for your participation at german Bloom Day! Wow! What a treat to look at your garden today. So much beauty. The Magnolia is gorgeous. I cannot wait until mine grows up to look like yours. LOL! Carolyn, I am in love with your yard! This is my first time to your blog, and I am so impressed. 🙂 Next winter I am moving to my great grandmother’s farmhouse. 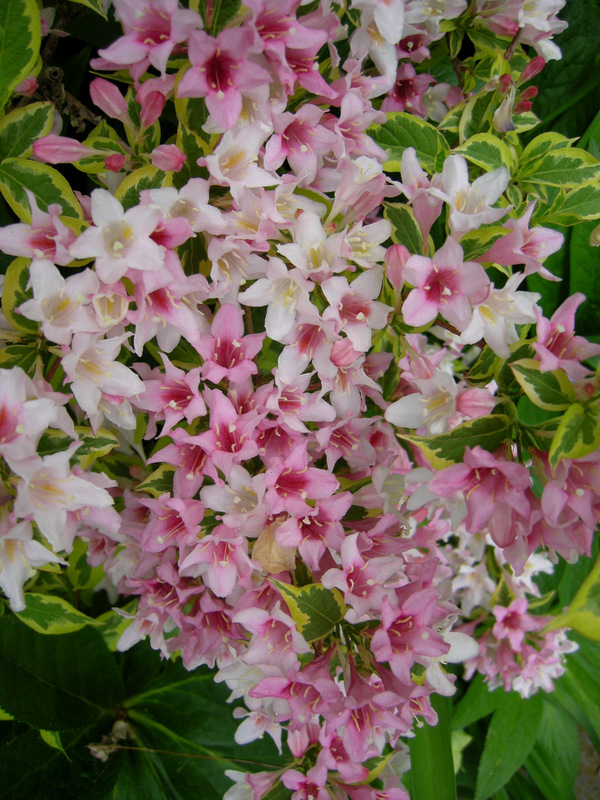 I have been making a wish list of plants & when they bloom to help me along, and I have just added doublefile viburnum & pink anemone clematis. They are absolutely gorgeous! Thanks for sharing!! Your garden is looking spectacular! 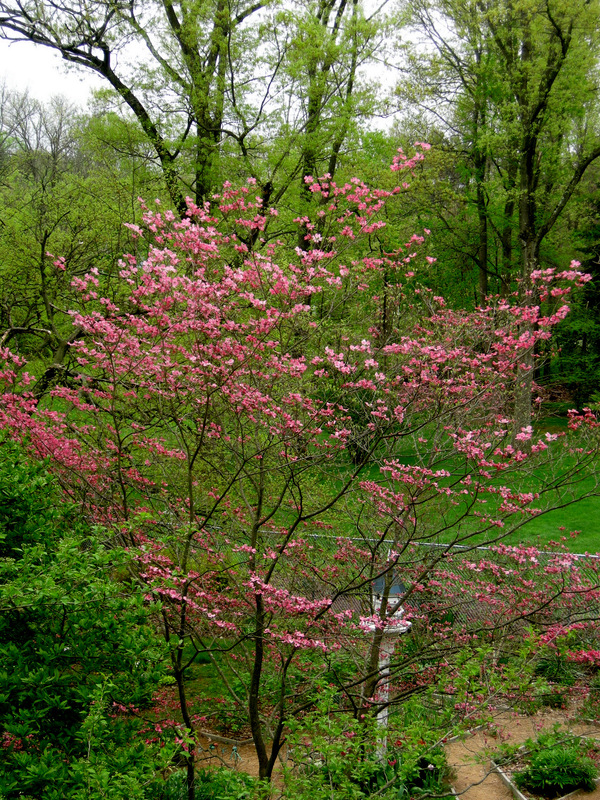 I especially like the Cornus florida ‘Cherokee Brave’ – had never seen a pink dogwood. It all looks great. Wow! Your climate is obviously very different from mine – I could never grow any of these. 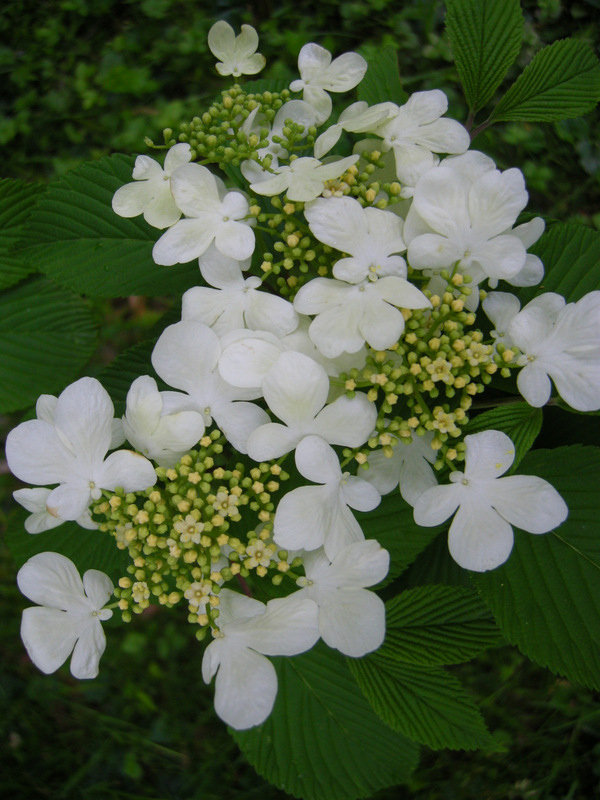 I think I’m most envious of the doublefile viburnum. So lovely Carolyn! How lucky you are that your husband is so willing to help! 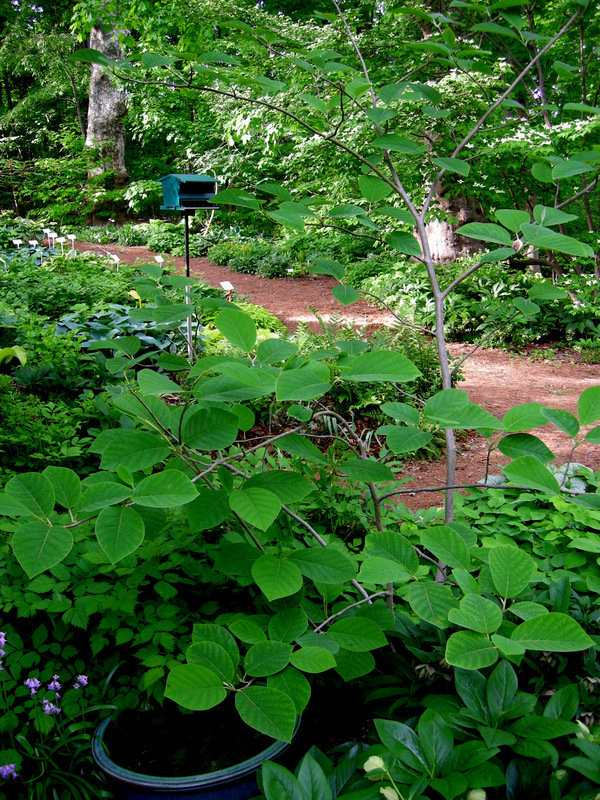 I’m with you on low-maintenance gardening! As much as I love working in the garden, I enjoy relaxing and looking at it even more. Carolyn – I remember that you commented about your wisteria on my blog once, and I was looking forward to seeing it. It is as spectacular as I imagined. Michael seems to have mastered the art of hacking back the wisteria without harming its flowering performance. My wisteria only produced 4 blooms this year. It’s always exciting to watch spring march northward. 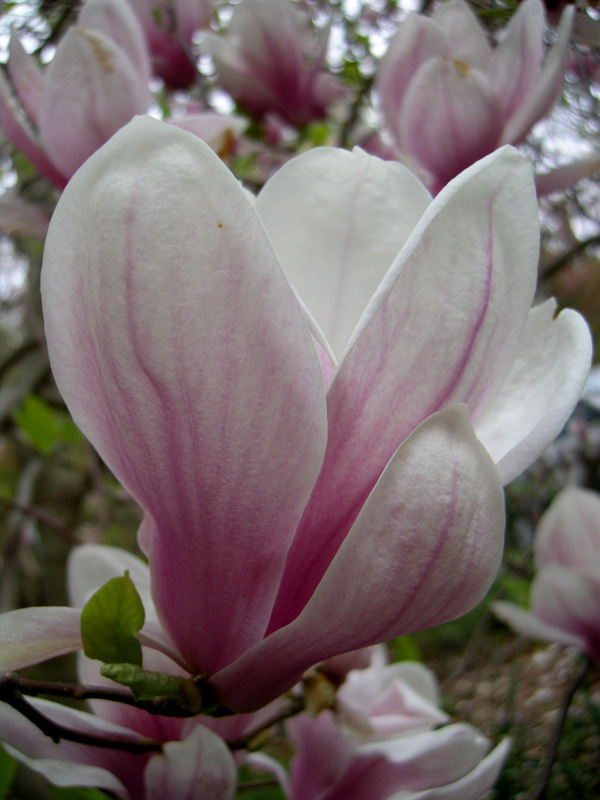 Your magnolias and dogwoods were in bloom here in March. 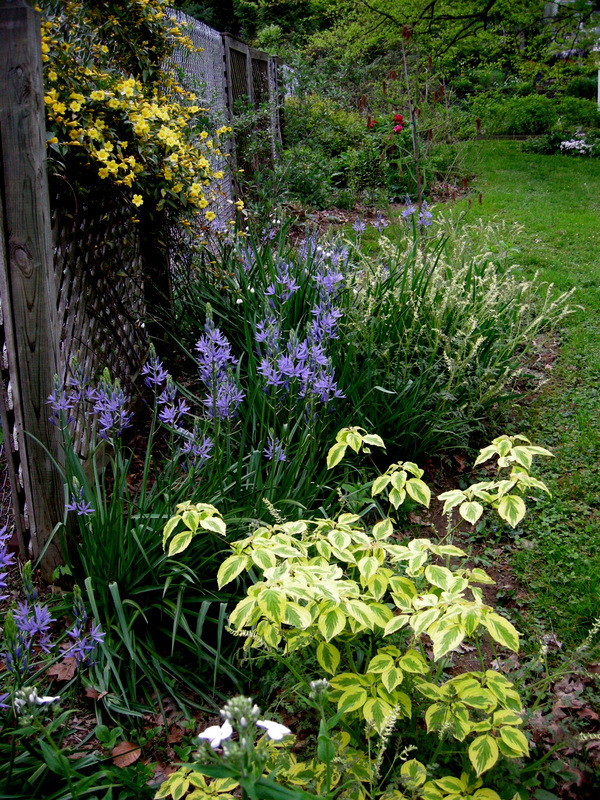 We’re into lilies, daylilies and hydrangeas already. We’re about to mow a field of wisteria. It will eat your house in the south. Your garden is looking very lovely this May! Isn’t it wonderful to have a supportive spouse in one’s gardening addiction! The paperbush buds are very interesting! Great photo…best of luck in the contest! And, Happy GBBD! Ha! I love the title of your post! What a vast variety you have. So cool to visit your blog and see so many plants and blooms I’m not familiar with. Beautiful! Happy May GBBD! 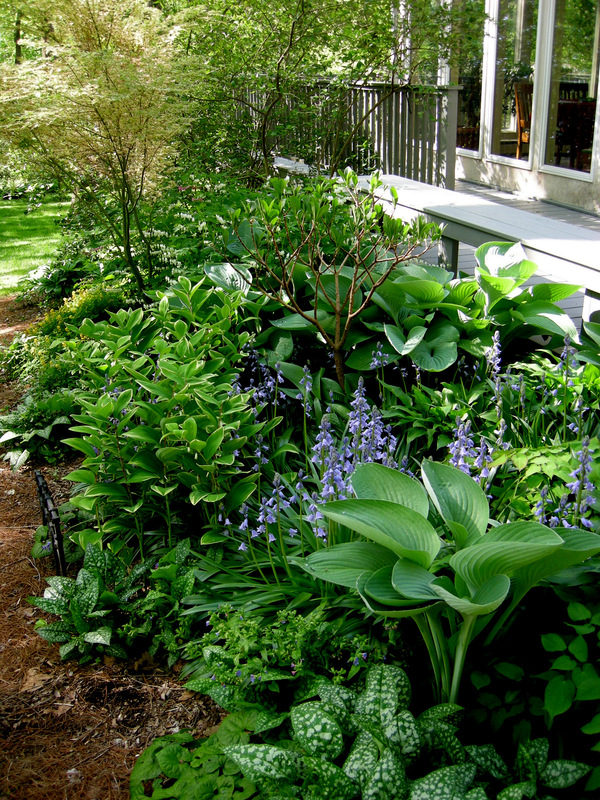 What beautiful compositions in your garden. I am as delighted as other commenters here about the wisteria/honeysuckle combo. Just yesterday I purchased my very first wisteria to train on a pergola we built last season. Any pointers? 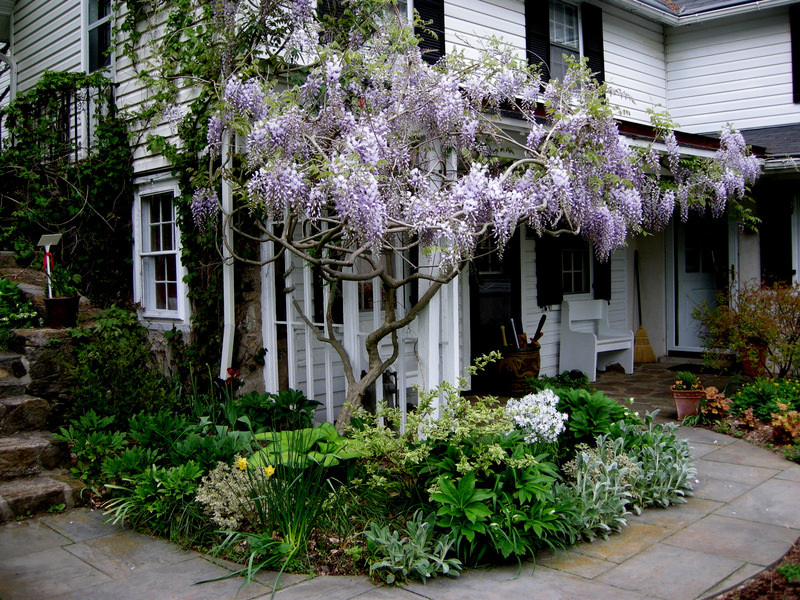 Or do you know of a good site dedicated to taming wisteria? This is so beautiful Carolyn! 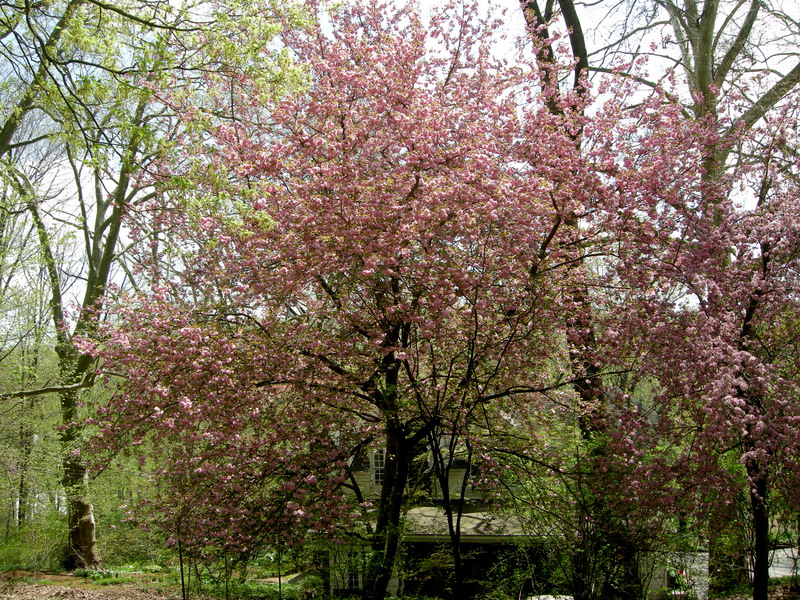 I long to have the room to plant all of those lovely flowering trees for spring! And I loved the planned view from your window also. So important in our climate, I think. The wisteria must be my favorite, however. Great info for training them also. So nice to see a husband and wife still loving and gardening together. I am very thankful for my hubby & that he loves and appreciates our garden. Forgot to mention GBBD post! As always your garden is looking lovely. 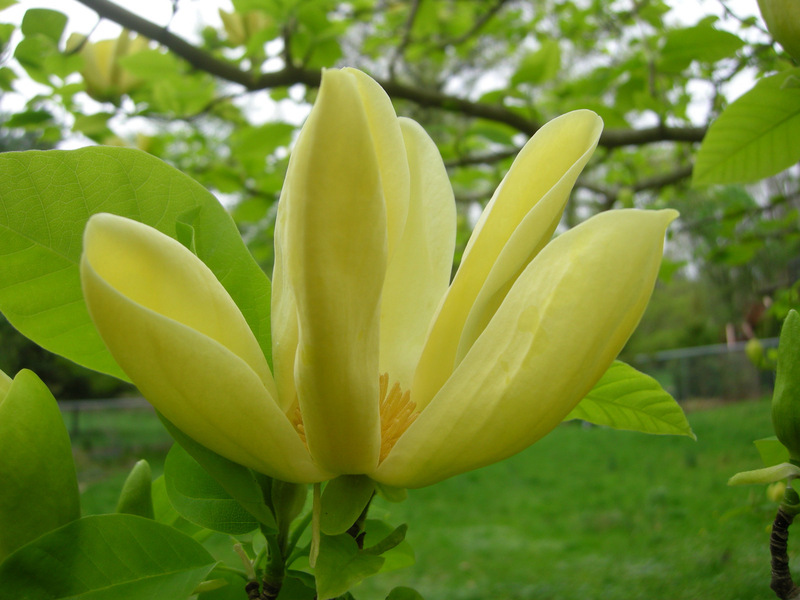 you have so many lovely Magnolia species, I wish I had more space to grow them, here they flower in april so all are finished here. 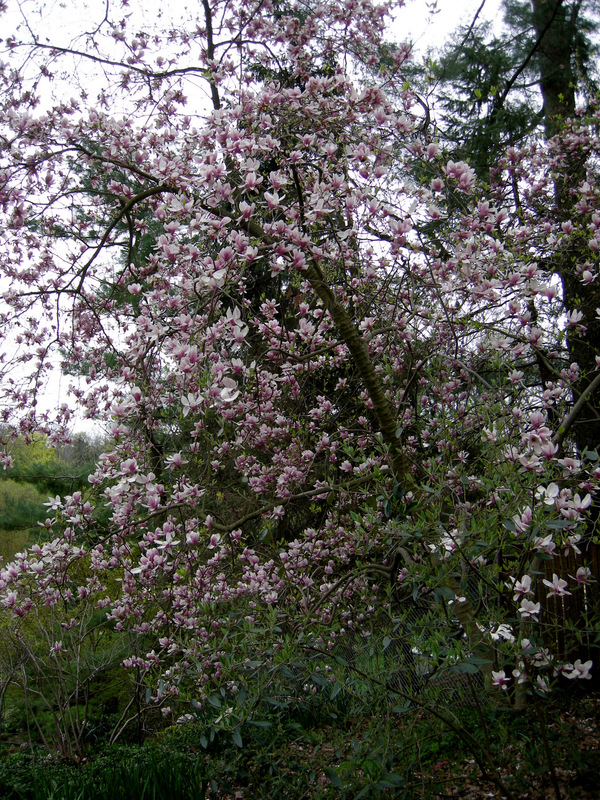 I’ve never heard of Halesia caroliniana ‘Rosea’, it looks very interesting. Nothing top be embarrassed about, that’s for sure! 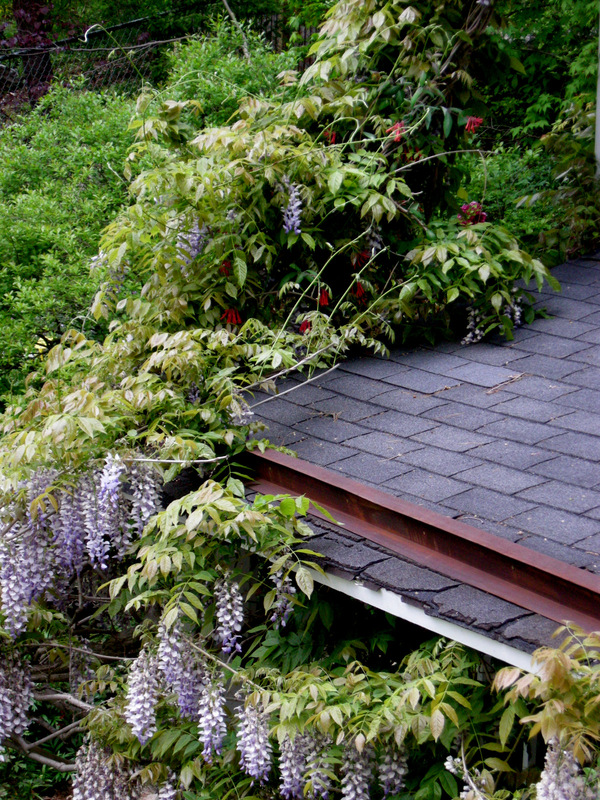 A garden club friend has a similar setup with her wisteria – for many years it was a patient husband doing battle to save the roof and gutters, in honor of the fabulous blooms. 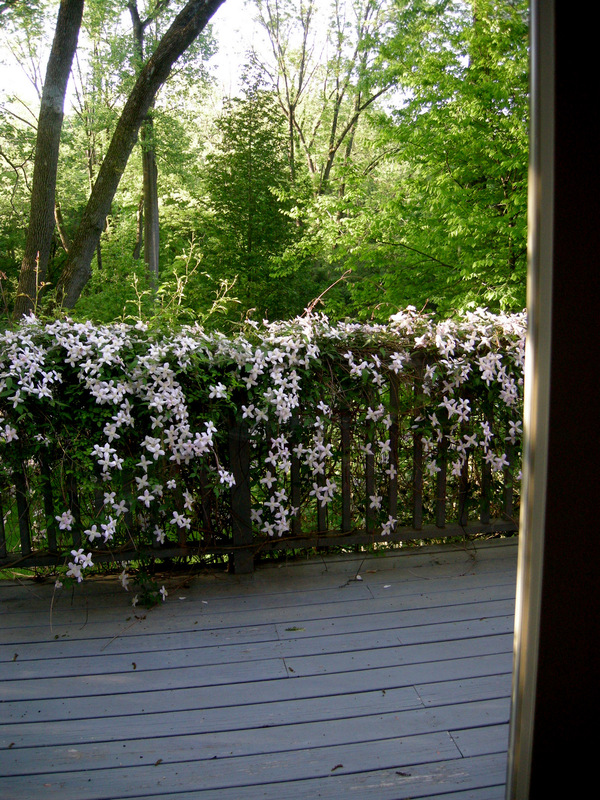 Love the deck decked with clematis! 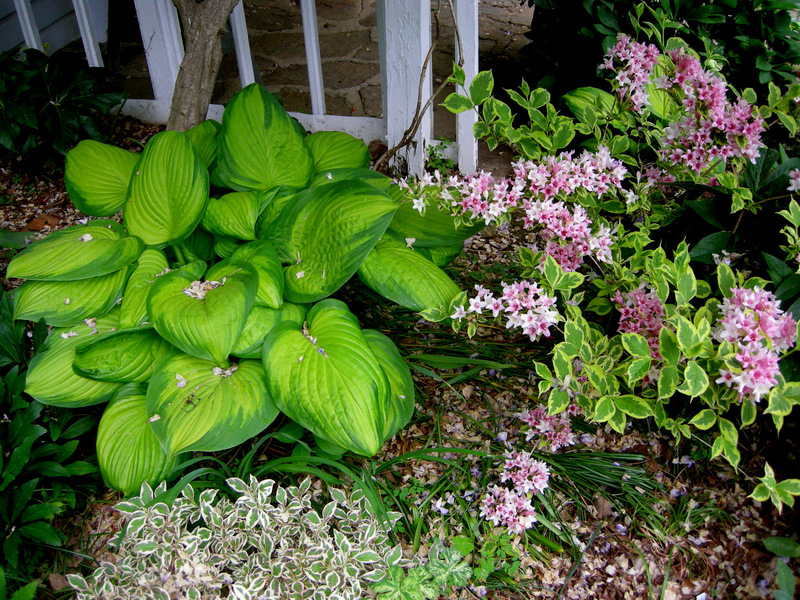 Hosta Stained Glass was just another shade plant until I saw it in your garden. Thanks for the inspiration. 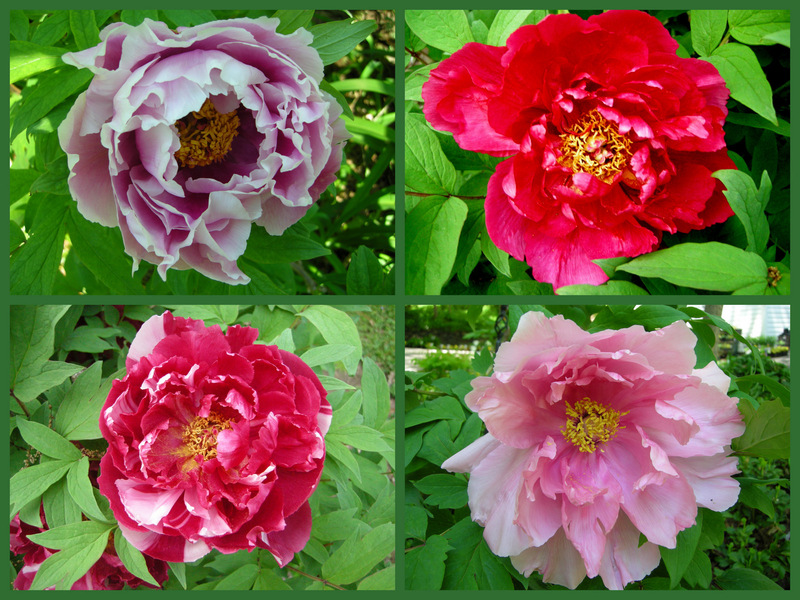 You weren’t kidding about an embarrassment of riches – 4 tree peonies fits the bill alone…and the Wisteria – swoon! 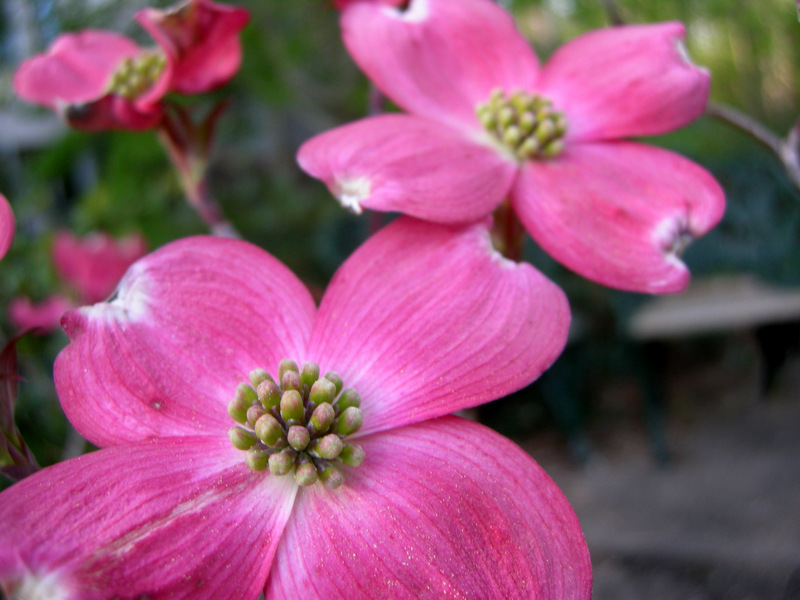 ‘Cherokee Brave’ dogwood…hyperventilating…. Hi Carolyn, There are so many beautiful plants and trees that it seems almost wrong to single out just a few for comment. 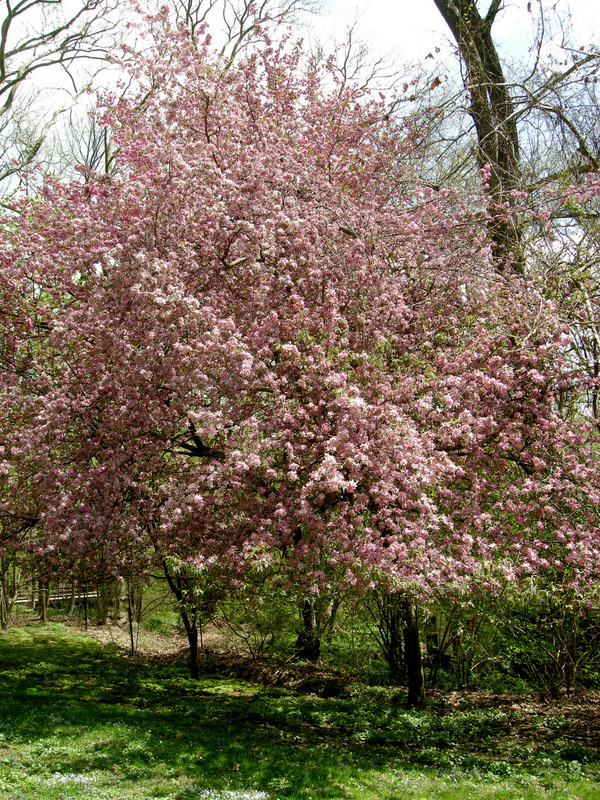 The Kwanzan cherry and pink dogwood really caught me eye, maybe because I have been wanting to add a pink flowering tree or shrub to my spring garden. I also took special note of the Spanish bluebells, which I thought were very pretty. You and your husband have done a fabulous job. You have such diversity and beautiful combinations. Happy GBBD! Your gardens are fabulous! 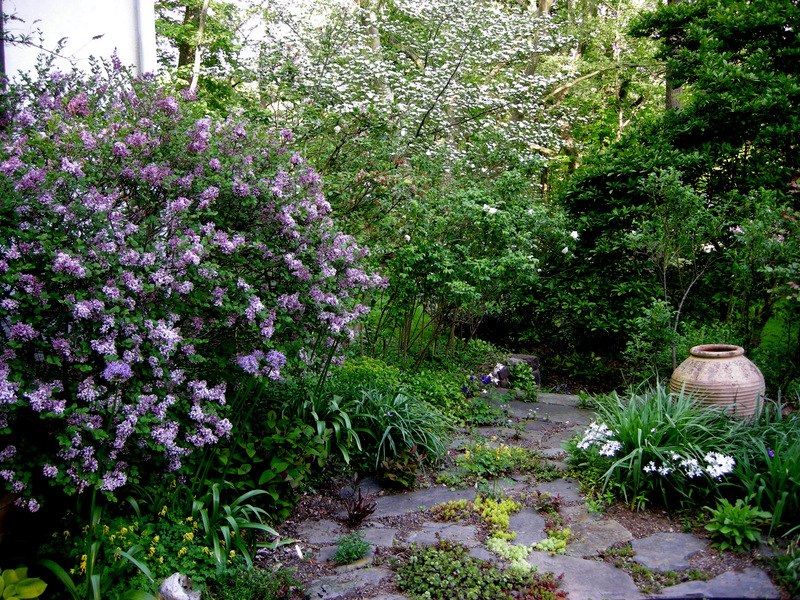 I love the stone path that passes the Korean lilac. It is enchanting, and I want to see where it goes! 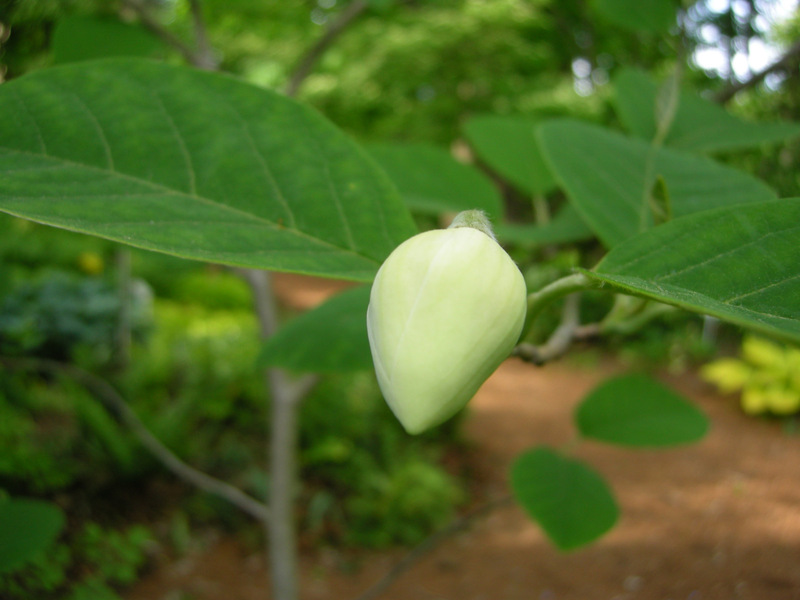 I was not familiar with Wilson’s magnolia or pagoda dogwood. Now they are both on my list of ‘research and would love to buy’. Ohhh Caroyln, you have a wealth of beauty in your gardens! They are sooo BEAUTIFUL! What I wouldn’t give to have some of your trees and flowers growing in my garden. My climate is very different from yours though…lots of sun and a much drier climate here in Utah. Just curious…what zone do you live in? So many wonderful flowers. You have a very beautiful garden. I feel delirious from the visual delights. How does one choose, where does one begin. 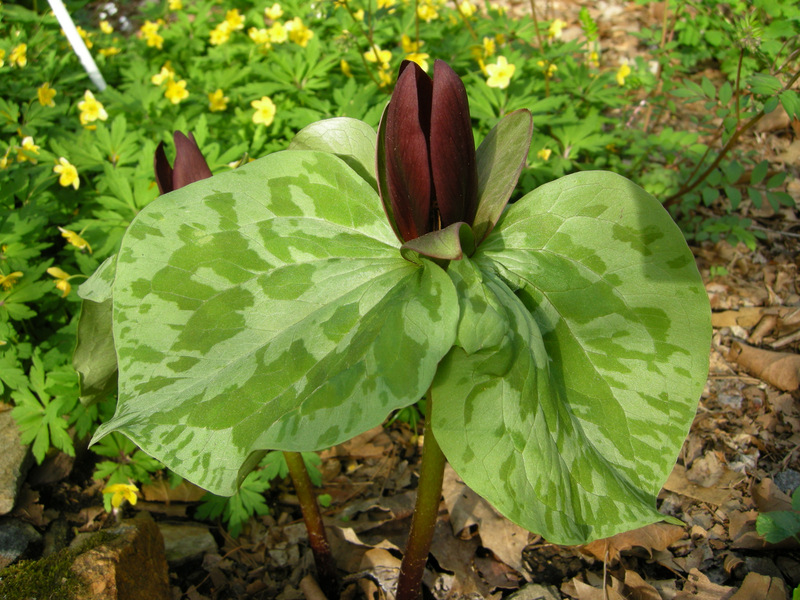 I would like to make note that I adore the Whipporwill flower, Trillium cuneatum because is look so hardwood forest woodland. Oh dear. It’s really almost too much beauty to take in in one sitting, it truly is. I’m simply speechless (which is a rarity for me – ha.) The work that you (and your hubby – bravo Mr. CSG!) put into your home must be absolutely worth every second and effort expended…I don’t know when I’ve ever seen such a serene, tranquil, garden of endless, endless surprise and beauty. Thanks for taking and sharing all these photos for us to delight in! Oh Carolyn, What a joy to visit your garden. I am drooling over your magnolias! 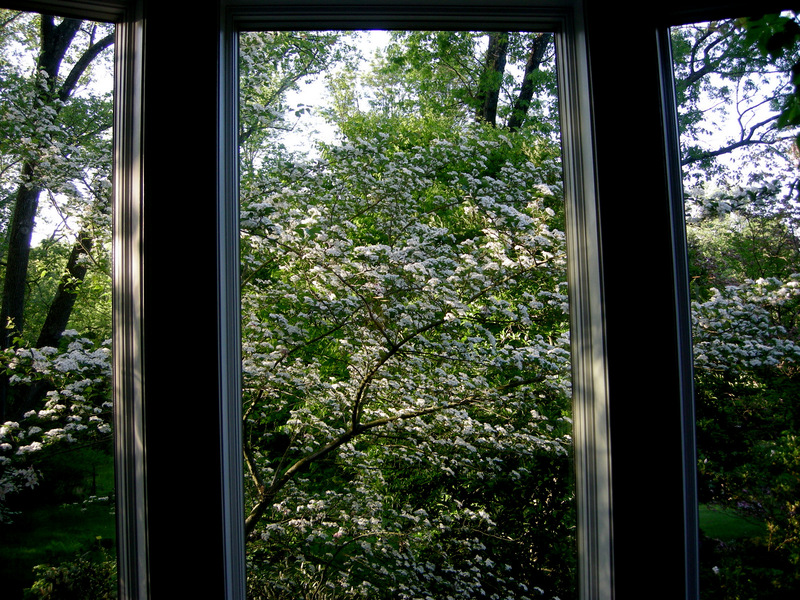 I love the inside/outside views with your hawthorn. Your garden and blog are such an inspiration . . . gorgeous! If only I could have a Michael of my own. Riches . . . you have many but embarrassment does not lie with you . . . I feel that way about my gardens after visiting yours. I have a sea of bishops weed to contend with. Alas! Your photos are wonderful too Carolyn. It must be intoxicating for you right now . . . to walk around your home and take in all the beauty. It is so sweet that you would dedicate this stunning post to your dear husband and partner. You asked about my experience with Dicentra ‘King of Hearts’ and Corydalis ‘Blackberry Wine’. 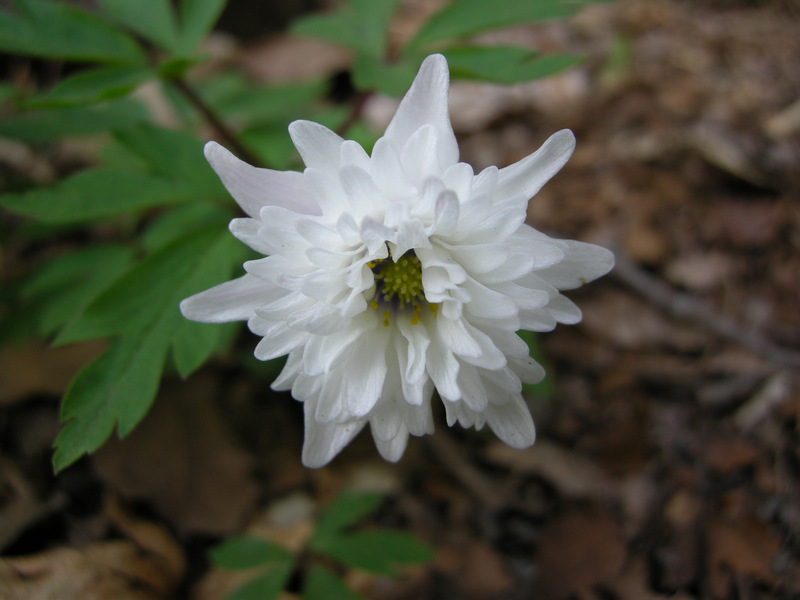 I planted 3 of the Dicentras, 2 died, I believe from a combination of squirrels digging and labrador violets invading. The third plant is strong and healthy & I divided it into 2 this spring. I planted 3 of the Corydalis, one died, I replaced it with another, and now all three are thriving. They are planted against the eastern foundation of the house, and get only morning sun. My soil is partly clay, but is incredibly well drained. I think the incredible drainage may do the trick. I will have to try again. What an awesome post…I thought I’d reached the end and there was more and more!!! Is that a Rodgersia in the background of the picture with your husband? whoa, that whippoorwill flower looks like the plant from little shop of horrors. feed me. Always a pleasure to read and see the wonderful gardens. I think this is the first time I have seen a glimpse or two of your house. Between the wisteria and the clematis on the railing my head was spinning. I am now thinking More Trees. All the best to you. This is a late reply, but I wanted to let you know I am amazed at what you do and have in your garden, everything! Added your page to my favoriets immediately!!! Love your awesome photos!! Just saw your entry for the photo contest, and came to see what it is called. Yours is my choice for winner this month! Don’t know what GBBD is…. just ran across that designation for only the second time! I do post an update of everything blooming in our garden each month, but not as part of any group effort. That said, I am slobbering all over the place from salivating over your gorgeous blooms! Our Yellow Bird has been in bloom and it was nice to see a familiar face! 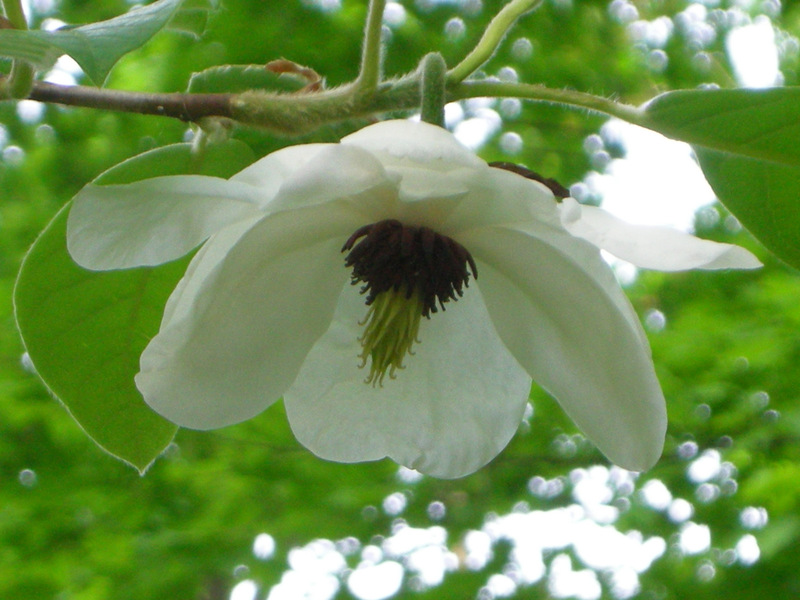 We have the Cherokee Chief, uncle or other close relative to your Brave, which is also blooming now as well. But that wisteria has got to be the treasure of the garden! 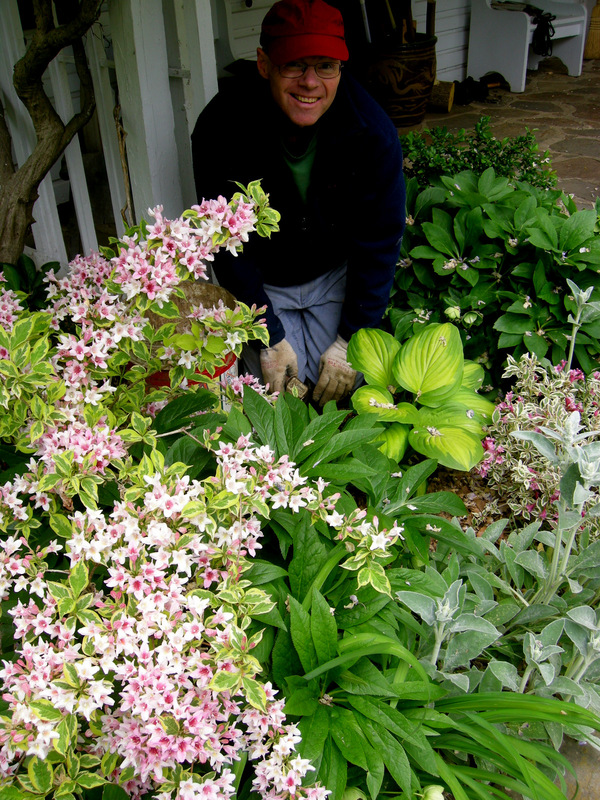 My husband also provides much of the brawn behind our gardens – so wonderful that it is a mutual labor of love. As for your GGW entry… what an incredible photograph! It reminds me of a velvet tassel. The detail is amazing. 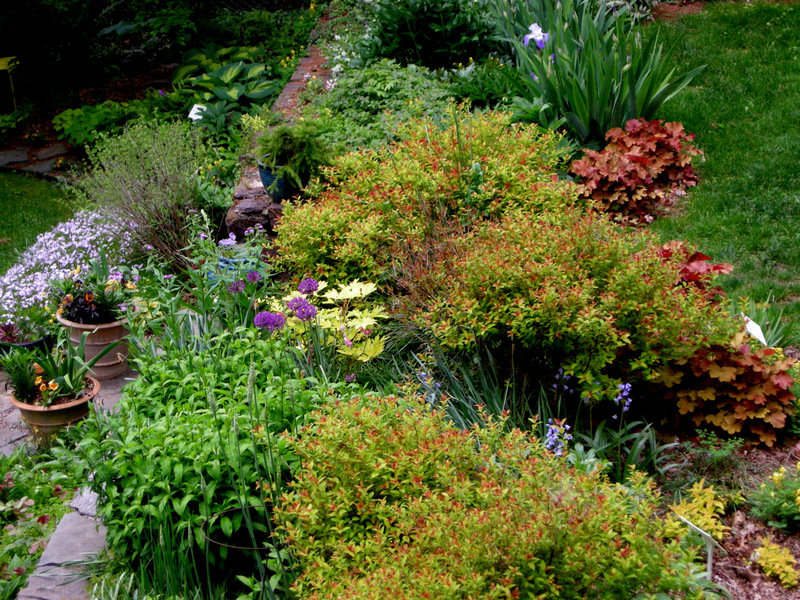 Carolyn, Your garden in May looks even more wonderful than it did in April. 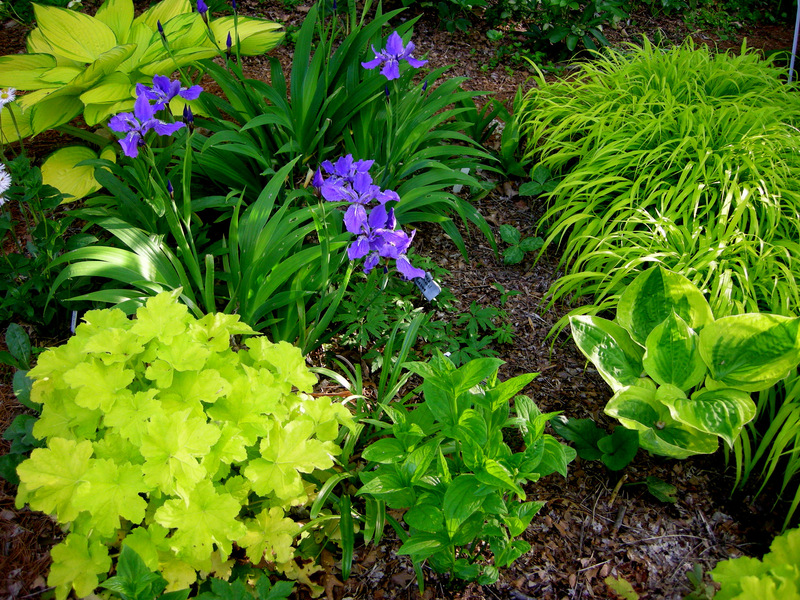 I am particularly taken with the combination of the blue irises and the gold-chartreuse foliage of hosta and heuchera.